European Union leaders on Sunday approved a historic Brexit deal, holding out hopes of close future ties even as one declared Britain’s withdrawal after four decades a ‘tragedy’. The 27 leaders of the bloc met without Prime Minister Theresa May to endorse the agreement, which sets the stage for Britain exit from the bloc on 29 March. 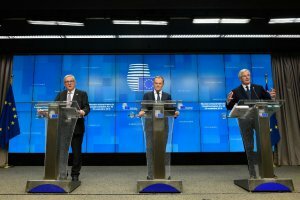 ‘EU27 has endorsed the Withdrawal Agreement and Political Declaration on the future EU-UK relations,’ European Council President Donald Tusk tweeted, as the leaders waited for May to join them. Arriving for a special summit in Brussels, European Commission President Jean-Claude Juncker, head of the bloc’s executive arm, said it was a ‘sad day’. ‘To see a country like Great Britain … leave the EU is not a moment of joy nor of celebration, it’s a sad moment and it’s a tragedy,’ he said. Germany’s Chancellor Angela Merkel hailed the deal as a ‘piece of diplomatic art’ but admitted that it left her with sadness. 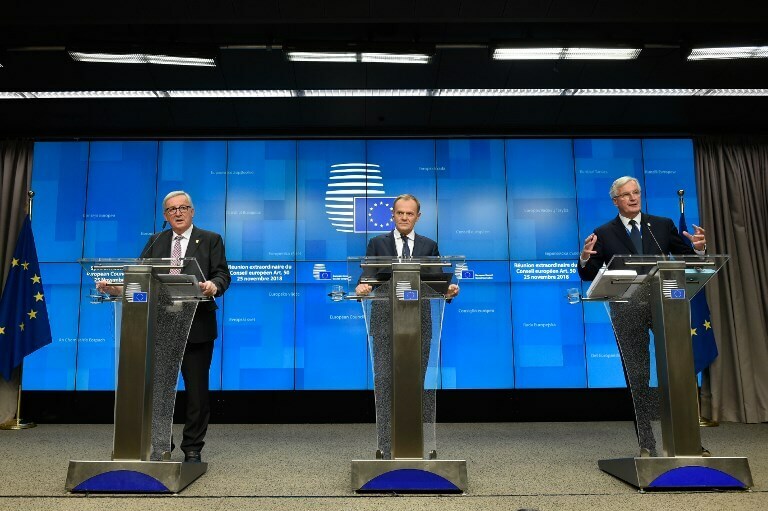 May, who arrived in Brussels on Saturday evening for final talks with Tusk and Juncker, was due to join the other leaders later in a highly symbolic moment. Forged during 17 months of tough negotiations, the withdrawal agreement covers financial matters, citizens’ rights, Northern Ireland and arrangements for a 21-month post-Brexit transition phase. A short political declaration that accompanies the text sets out hopes for future security and trade ties. But it is not the final stage, as the House of Commons in London must still approve the deal – and many MPs have warned they will not back it. Until the agreement is approved, all sides are still planning for the potentially disastrous possibility that Britain leaves the EU with no new arrangements in place. Media reports in London on Sunday suggested some of May’s own ministers were secretly working with EU diplomats on a ‘Plan B’ in case parliament rejected the agreement next month. But Austrian Chancellor Sebastian Kurz, whose country holds the rotating EU presidency, said: ‘It is important that everyone in the UK is aware that the result that is now available is the result. Dutch Prime Minister Mark Rutte added: ‘Overall, I think this is the max that we can all do, both Theresa May and her government as well as the European Union. Tusk said on the eve of the summit that ‘no-one will have reasons to be happy’ when Brexit happens, but he said the terms agreed would ‘reduce the risks and losses’. In London, eurosceptics in May’s Conservative Party and their Northern Irish allies warn they will not support the agreement, which they argue keeps Britain too close to the EU. But in an open ‘letter to the nation’ on Sunday, May said it delivered on the 2016 referendum vote to leave, and was a ‘deal for a brighter future’. Britain remains deeply divided over the decision, but the prime minister said that finally leaving could be ‘a moment of renewal and reconciliation’. ‘To do that we need to get on with Brexit now by getting behind this deal,’ she said. The summit risked being derailed by a late objection to the deal by Spain over the British territory of Gibraltar. Spanish Prime Minister Pedro Sánchez threatened to reject it unless his country kept a veto over future changes to EU ties with ‘The Rock’, which borders Spain and which it has long claimed. The impasse was resolved when Britain promised to continue bilateral talks with Madrid after Brexit – although that itself caused further tensions. Sánchez claimed that discussions would cover the ‘co-sovereignty’ of Gibraltar, but May rejected this. There are also concerns in EU states such as France, Spain, Portugal and the Netherlands over fishing rights once Britain leaves the bloc’s Common Fisheries Policy after the transition, which ends in December 2020. In an annex to the summit conclusions, the 27 EU leaders says a fishing deal based on ‘reciprocal access and existing quotas’ should be agreed as a priority after Brexit.